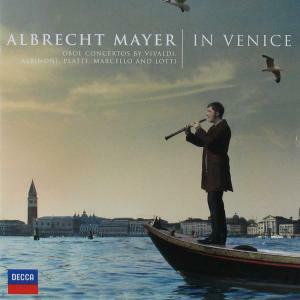 Albrecht Mayer (born June 3, 1965, Erlangen) is a German classical oboist. Mayer sang as a child in the Cathedral Choir in Bamberg. He was a student of Gerhard Scheuer, Georg Meerwein, Maurice Bourgue and Ingo Goritzki, and began his professional career as Principal oboist for the Bamberg Symphony Orchestra in 1990. He joined the Berlin Philharmonic Orchestra as Principal oboist in 1992, and has been Principal oboist there since, together with Jonathan Kelly. Mayer used to play a Green Line Oboe by the French company Buffet Crampon, but in 2009 switched to a line of wind instruments (Oboe, Oboe d'amore and English Horn) named after him by the German instrument makers Gebrüder Mönnig. Albrecht Mayer joins the Berliner Philharmonisches Bläserensemble and the Berlin Philharmonic Winds Soloists ensemble, amongst other chamber music ensembles.